Interpersonal relationships are the core of our societal system and have been since before the dawn of civilization. In today's world, friends, lovers, companions, and confidants make valuable contributions to our everyday lives. These are the relationships whose members are not automatically participants as a result of their birth and kin affiliations. The focus is on these relationships that must be forged from the sometimes indifferent, and sometimes hostile world. Yet, there is still much that is not known about how these relationships evolve, how partners communicate in on-going relationships, how people keep their relationships together, and how they cope when they fall apart. Primary to the focus of this book is the underlying theme of evolving interpersonal relationships from the initial encounter to the mature alliance. 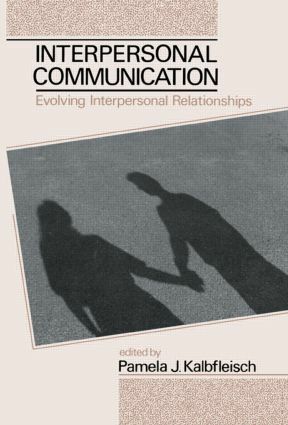 The contributors to this volume provide a contemporary perspective for the study of interpersonal relationships. Fresh areas of scholarly inquiry are presented and existing approaches are re-examined. Research in the introductory chapters breaks new ground, and appraises the ultimate question of what impact initial interactions have on further relational development. The mid-section of the volume concerns communication issues that confront the members of a relationship in process, focusing on how conflict and jealousy are communicated to a relational partner. This research considers relational development as well as obstacles and barriers to evolving relationships. The concluding chapters probe the question: Ultimately do all good things have to come to an end? Employing innovative techniques to examine maturing and disengaging relationships, the research presented here focuses on how interpersonal relationships become committed and mature.